A dollar today is better than a dollar tomorrow….. However, most people are saving dollars today that will be worth considerably less in the future. Yet – we hope we have enough depreciating dollars to live off of in retirement. How foolish are we? Why would anyone try to save water in a bucket that has a hole in it? Putting that in today’s words – having wealth, or a comfortable retirement for that matter, means that you must have multiple income streams and not just an accumulated amount in your 401K, 403b, IRA or whatever. 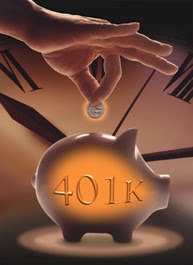 Don’t let your 401K be your sole means of retirement – it is only designed to be a supplement source of wealth to help fund your retirement.